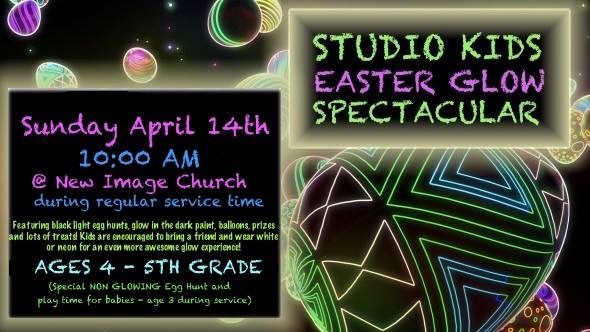 Children from ages 4 to 5th grade can participate in our Studio Kids Easter Glow Spectacular at New Image Church Sunday, April 14 at 10 a.m. during regular church service time. The event will feature black-light egg hunts, glow-in-the-dark paints, balloons, and lots of treats. Children are encouraged to wear white or neon for an even more awesome glow experience. Children up to age 3 can participate in a non-glowing egg hunt and special play time during the service.